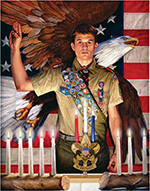 Eagle Scout is the highest rank attainable in the Scouting BSA program of the Boy Scouts of America (BSA). A Scout who attains this rank is called an Eagle Scout or Eagle. 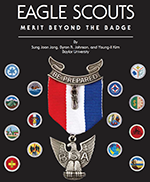 Since its introduction in 1911, the Eagle Scout rank has been earned by more than two million young men and soon young women. The National Eagle Scout Association is young men and women searching for dynamic and challenging leadership roles. NESA is older Eagle Scouts who desire using their efforts and influence toward forming the kind of young men and women America needs for leadership. The objective of NESA is to serve—to serve Eagle Scouts and through them, the entire movement of Scouting. Click the image above to learn more and visit the NESA website.